Figure 1. Open-pit mining at Belmont is conducted on a large scale. Trucks are constantly being filled with ore to be taken to the processing plant. Photo by A. Lucas. Since the 1970s, Brazil has been a consistent source of emerald. This is especially true today, with steady production from the Itabira/Nova Era belt in the gemrich state of Minas Gerais. Along with successes there have been challenges for the Brazilian emerald industry. Increasingly strict environmental regulations and higher labor costs have made production more expensive. Mining companies have had disagreements with land owners, and there have been legal issues with the independent miners known as garimpeiros. Another challenging issue facing the mining, cutting, and trading sectors is the rapid rise of the Brazilian real against the U.S. dollar. While Brazilian emeralds were not traditionally known for their quality, this perception has been changing. Stones from the Itabira/Nova Era belt reportedly sell for up to $30,000 per carat. Nova Era tends to produce clean faceted stones, which are highly popular with jewelry manufacturers. The emeralds’ fine color and good transparency make this material highly sought after in the marketplace. The Belmont property was originally a cattle ranch and remains one today. But since 1978, Belmont has also operated a well-known emerald mine. It is managed by Marcelo Ribeiro, whose grandfather discovered emeralds on the ranch by accident. It began as an open-pit operation (figure 1). Bulldozers remove the weathered emerald-bearing material and transport it to a processing area for washing and sorting. After two decades of open-pit mining, Belmont added underground operations in 1998. Miners were lowered into a 75 m vertical shaft, from which they dug side tunnels by hand or using explosives, removing the schist and bringing it back up the shaft. An elevator carried five personnel as well as mined material in and out of the underground mine. During this contributor’s visit to Belmont in 2004, the company estimated another 10–15 years of production remained in the open-pit mine. Now they believe the open-pit area may have a much longer life span. Since 2004, Belmont has expanded the underground operation into a ramp-style underground mine where trucks drive directly into the workings. The emeraldbearing schist is broken up by explosives, and front loaders empty it onto trucks to be taken to the processing plant. Optical sorting has replaced hand picking of the emeralds. These devices are faster and have a higher recovery rate, while eliminating the possibility of theft. The optical sorting instrument used by Belmont can be cus tomized to identify a variety of minerals. A charge-coupled device (CCD) camera recognizes the emeralds in the schist by color, triggering an air blast that moves them to a conveyor belt (figure 2). Figure 2. A conveyer belt brings ore into the optical sorter at Belmont for the CCD cameras to scan. Photo by Eric Welch. Belmont has processed 70,000 tonnes of ore annually for the last three years, recovering 250,000 grams of rough emerald per year. That works out to 1 g of emerald per 0.28 tonnes of processed ore. But to obtain the 70,000 tonnes of emerald-bearing ore, Belmont must first remove 350,000 tonnes of overburden. While the average production of emerald-bearing schist is 6,000 tonnes per month, the output is higher during the dry season and lower during the rainy season that runs from September through February. 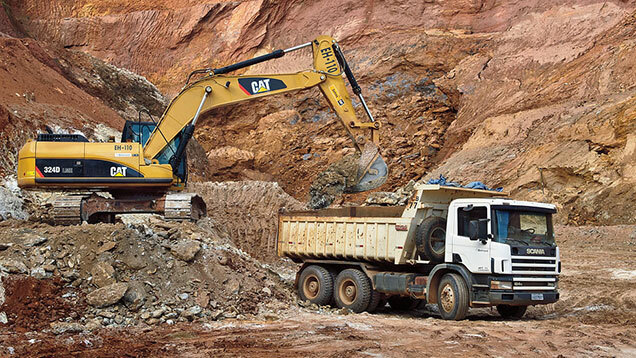 Eighty percent of the production is from open-pit mining, 20% from the underground operation. This is because Belmont’s processing plant is designed primarily for the weathered material from the open-pit operation. The processing plant is being expanded to better handle the harder emerald-bearing schist. By the end of 2012, Belmont expects underground mining to account for half of the output. 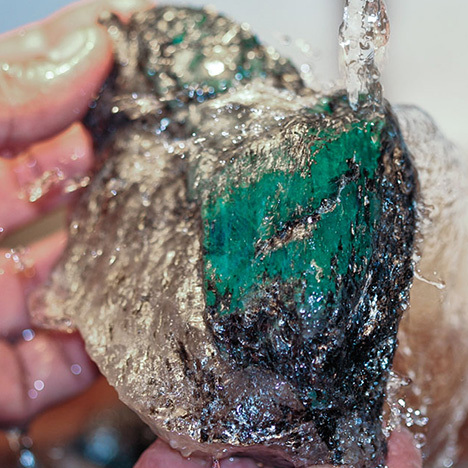 On average, 1 g of rough emerald produces 1ct of faceted emerald, or 250,000 carats per year. The typical size range of the rough is 2–20 mm or 0.2–20 g. Belmont is known for high-quality rough that allows cutters to consistently produce calibrated 1–5 mm rounds, as well as 1–10 ct center stones for jewelry manufacturers. The mine is currently undergoing expansion and will be adding another highly efficient optical sorter. The company is also expanding mining operations through a joint venture with former owners of the Rocha emerald mine, which borders Belmont to the north. Rocha opened in 2005 but closed after only a few years. The new joint venture is a 50/50 split between Belmont and the Rocha group, and Rocha has been renamed the Canaan mine, its original name. Discus sions are ongoing between the mining partnersand the land owner, who prefers the operation be an underground mine. Under Brazilian law a percentage of the production goes to the land owner, even when another company owns the mining rights. Belmont has opened a tunnel entrance into the Canaan mine that is currently 120 m long. Once it is 400 m long and 50 m deep, the drive-in tunnel will reach the mineralized zone, where core samples showed emerald-bearing rock. Belmont estimates that by July 2012 it will be removing the first trucks of emeraldbearing ore from Canaan for processing. Mr. Ribeiro expects a production rate comparable to that of the underground operation at Belmont, which is 3.5 to 4 g of emerald per tonne of ore. He believes the emeralds will be larger but have a lighter color due to lower chromium content. Belmont’s water reclamation system incorporates a five-pond system that uses filtering and gravity to remove particles introduced by mining and processing. With plans to increase underground mining, there will be less fine particle overburden to remove by washing, resulting in less need for water. The company expects its water reclamation to be even more efficient and less expensive at that point, minimizing the impact on the environment. Belmont estimates the life of the mine according to the market price for emerald. If the price goes up 30%, the mine’s life expectancy doubles. If the price drops 30%, the life of the mine is cut in half. At current prices, Mr. Ribeiro expects 20–30 more years of profitable operation unless the production rate increases significantly. Also contributing to the mine’s life span is the fact that Belmont cuts some of its own rough, thus moving up the value chain and recording higher profits per tonne of ore mined. By earning more revenue per tonne, Belmont can afford to mine deeper underground. They currently cut 25% of the production by value (10% by volume). All of their cutting is done close to the mine. Emeralds were discovered in the Capoeirana area of Nova Era in 1988. 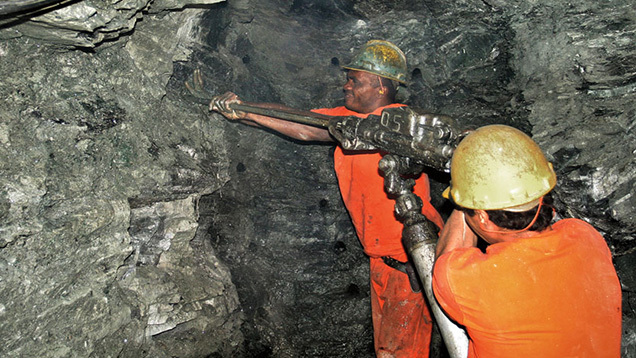 Here the extraction is done primarily by independent miners and smaller-scale operations. The emeralds can be of very good color and quality, surpassing those previously produced from Santa Terezinha de Goiás. In 2004, this contributor saw considerable activity by independent miners in pits, tunnels, and shafts. The work was very labor intensive. The miners used some explosives but mostly hammers, picks, and shovels. They would load the ore in wheelbarrows, take it to a washing area, and dump a barrel of water over it. The miners would then use hammers to break up some of the larger pieces of schist, shovel the ore onto a washing screen, and continue breaking the pieces with a hammer. They would then sort through the screen by hand to look for any schist that contained emerald crystals (figure 3). Figure 3. Much of the production at Capoeirana is done by independent miners. 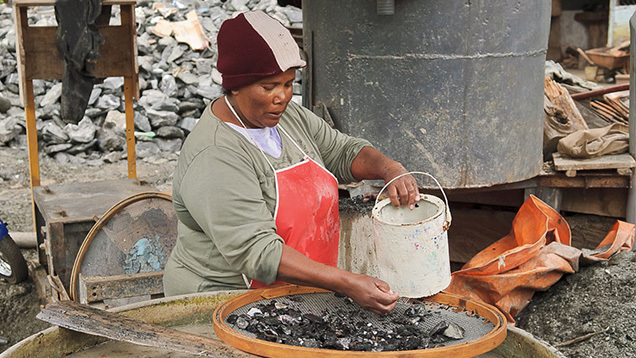 The processing of the ore is accomplished by simple hand washing. Photo by A. Lucas. One operation was somewhat mechanized: The miner was strapped to a cable and lowered by a winch into the mine and then brought back up with bags full of ore to be processed. A 2009 visit to the Capoeirana area revealed that things had changed considerably since 2004. This time there were far fewer miners working, and the village itself seemed noticeably quieter—there were no dealers in the street, and nobody offered emerald crystals for sale. One reason given for the downturn was that the area’s mines were becoming too deep for independent miners. Some of the shafts were reaching depths of 100 m, where it was difficult to work the hard rock using ladders and hand tools. Also, some of the underground workings were becoming very close to each other, and the thin walls between them increased the risk of cave-ins. The global economic recession also took its toll on the Capoeirana emerald miners, as it has on the entire Brazilian gem industry. Because emeralds are traded in the U.S. dollar and the Brazilian real has gained so dramatically against the dollar, it has become very difficult for these inde pendent miners to make a living. Many have moved on to other areas where the deposits might be easier to work, while others have returned to agriculture. Companies such as Belmont were looking to purchase some of these properties so they could bring in a more sophisticated and profitable operation. Mining at Capoeirana is done by a cooperative in which individual miners hold rights to sections of the deposit. The miners must be part of the cooperative, and they can only buy mining rights from individuals who have purchased theirs from the cooperative. The Montebello mine, under the management of Sergio Martins (Stone World, São Paulo), is a small but fairly mechanized operation, especially for Capoeirana, where most of the mining is done by garimpeiros. Montebello is an underground mine where the miners drill into the mica schist (figure 4) and load the holes with explosives. Using various hand tools and shovels, they load carts with ore. The carts are pulled along tracks to take the ore to the elevator, where it is hauled up to the surface for processing. The mineralized zone is approximately 100 m wide and 300 m deep. Figure 4. At Montebello, miners drill into the hard schist to prepare it for blasting. Photo by A. Lucas. Processing at the Montebello mine is also more sophisticated than elsewhere in the Capoeirana area. After washing the ore through sluices, the workers put it on a sorting table and carefully look for emerald crystals in the schist. In recent months, since the beginning of the more sophisticated small-scale operations such as Monte - bello, Capoeirana has turned out fine-quality material and faceted stones from 10 to 20 ct. Overall production figures are hard to estimate due to the degree of smallscale mining, but a low estimate for the last two years is 20 to 30 kg per month of facet-grade material, with fine-quality material accounting for at least 1 to 2 kg of the total. Emeralds from this area tend to be larger, and it is rare to find rough less than 1 g (e.g., figure 5). However, most of the crystals break during removal from the schist. Even the broken pieces can weigh 20–50 g, and rough fragments as large as 1 kg have been recovered. 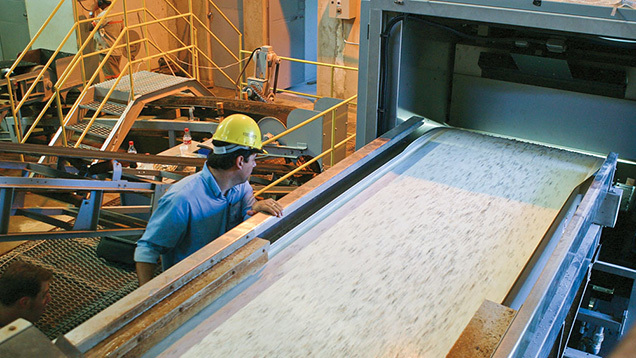 The higher-quality material is typically kept in Brazil for cutting, with the rest exported primarily to India. The state of Bahia produces approximately 500 to 1,000 kg of emerald each month, but the quality is usually lower than that of Itabira/Nova Era. While there aresome fine-quality stones from Bahia, the vast majority are highly included. Most of the mining is done by garimpeiros, in the Carnaíba and Socotó areas. Santa Terezinha in Goiás State was an important emerald-producing area from the 1970s through the 1990s, but the last decade has seen little production. One of the advantages of this area was that the emeralds were found by mining the deposit in a straight line. Because the emeralds were fairly evenly distributed, production was consistent and predictable. This is completely different from emerald mining in Itabira/Nova Era, where the gems are locally concentrated and output is more sporadic. At Santa Terezinha, emeralds were found in talccarbonate schist as opposed to Nova Era’s harder mica schist. This made extraction of the emerald crystals easier. Brazil’s emerald production goes to both domestic cutters and foreign buyers who take the rough back to cutting centers in their own countries. Companies from Jaipur, India, are able to buy entire mine productions because their cutting facilities can handle all sizes and qualities of emerald, and they have a market for the entire range of goods. This gives them a considerable advantage, allowing them to offer a good price for the entire production. Brazilian cutters have higher labor costs, so they must gear their operations toward the product they can sell for a price that absorbs these costs. Rather than purchasing the entire mine production, they must buy a pick of the mine production—and pay a higher price for it. They have become adept at paying just enough to make it enticing for the miners to sell them the better quality and sizes, while staying competitive in the global market. Brazilian cutters have found a niche in fine-quality calibrated goods that are enticing to manu facturers worldwide (figure 6). This enables them to hit a profitable price point, and they can also cut larger, good-quality emeralds. Figure 6. The wholesale emerald trade in Brazil is quite active. Businesses such as Sergio Martins’ Stone World (shown here in his former office at Teofilo Otoni) enjoy a thriving international and domestic market. Photo by A. Lucas. There are substantial challenges facing the Brazilian emerald industry. Stricter environmental regulations increase the cost of mining and make future finds less likely. The cost of labor is constantly rising, making it necessary to invest in technology. As the Brazilian real grows stronger against the dollar, the revenue that can be realized is declining while costs are increasing. Yet the potential for emerald production from the Itabira/Nova Era belt remains extremely promising. These deposits may very well warrant the investment needed for exploitation. With advanced mining technology, plus high-end domestic cutting generating greater revenue and moving mining companies up the value chain, the future of the Brazilian emerald industry looks very encouraging. Andy Lucas is manager of field gemology for content strategy at GIA in Carlsbad.